This chapter introduces the research model designed for this study. A test of the measurement model is presented in detail. The software utilized in this research is the PLS-Graph version 3.0. A partial least square (PLS) data analysis was run on students, faculty, and staff datasets respectively. This chapter also reports all results on the building of the structural model that represents the relationship between time management quality and understanding of temporal structures. PLS results for students, faculty, and staff members are reported respectively. This chapter also summarizes the differences among students, faculty, and staff in their capture, use and understanding of different types of temporal structures. Our fundamental research question for this study is whether the quality of individual time management is associated with individual capability to manipulate temporal structures through electronic calendar tools. 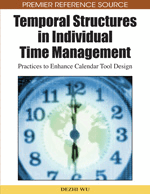 Recent research (Wu et al., 2006) found that individual time managers actively utilize a variety of temporal structures in their personal time management practices. Most professionals in this study recorded explicit temporal structures in their electronic calendar tools to support their work. Our study extends this finding to further explore what constructs can be used to measure individual capabilities to manipulate temporal structures, and what constructs affect the quality of individual time management. Moreover, we investigate the relationships between the quality of individual time management and temporal structure knowledge and its different levels of usage. We also expect that some correlations exist among individual time management quality constructs. Therefore, this study is the first step to provide evidence of whether temporal structures are useful and worthwhile to be incorporated in current electronic calendar tools. In Chapter 7, the research model for understanding the relationships between time management quality and temporal structures usage factors was first described. Figure 3 in Chapter 7 depicts the conceptual model of the relationships between the quality of individual time management and different levels of temporal structure manipulation in personal calendar tools, and additional relationships among individual time management constructs. Detailed model components will be explained in later sections. Four dimensions for assessing the quality of individual time management were proposed. They are planning, meeting deadlines, sensing a lack of time control, and engaging in procrastination behavior. The model indicates that these dimensions will have significant correlations with temporal structure dependent constructs, that is, temporal structure knowledge, use of explicit temporal structures, understanding of implicit temporal structures, creation of temporal structures, and understanding of temporal structure relationships. Planning and meeting deadlines are predicted to be positively correlated with the dependent temporal structure constructs, and sensing a lack of time control and engaging in procrastination behavior are correspondingly proposed to be negatively correlated with these constructs. It is also assumed that correlations exist among the four constructs for quality of individual time management. These constructs are drawn from the literature, but prior research has not investigated their relationships. We predict that planning will have a positive relation with meeting deadlines and sensing a lack of time control will be significantly related to engaging in procrastination behavior, and thus, will have a negative relation with meeting deadlines. We also predict that engaging in procrastination behavior will have a negative relation with both planning and meeting deadlines. These predictions are shown in the proposed overall research model in Figure 1 (Figure 3 in Chapter 7). A plus sign (+) represents the positive relationships between two variables, and the minus sign (“-”) stands for a negative relation between two variables in this research model.